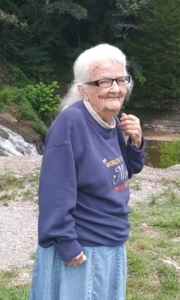 Mary "Little Granny" Brasfield, age 81, of Ethridge, TN passed away Friday, April 05, 2019 at Vanderbilt University Medical Center in Nashville, TN. She was a native of Arkansas, a retired caregiver, loving mother and grandmother, and a member of House of Prayer Pentecostal Church. Born Sunday, May 9, 1937, she was the daughter of the late Robert Lane and the late Oma Smith Lane Wiggins. She was also preceded in death by her husband, Ottis Lee Brasfield, Sr.; brothers, RC Lane and Lawrence Lane; sisters, Martha Lancaster and Wanda Shepherd; son, Robert Earl Brasfield; and grandchildren, Keith Lee Brasfield and Johnathon Casey Brasfield. Surviving are sons, Ottis Lee Brasfield, Jr. (Felisha), Tony Allen Brasfield, Sr., Teddy Gene Brasfield, Sr. and Timmy Joe Brasfield, Sr. (Monica), daughter, Helen McCord (Cleve); 15 grandchildren; 40 great-grandchildren; and 2 great-great-grandchildren. Arrangements are being handled by Neal Funeral Home, 231 N. Military Avenue, Lawrenceburg, Tennessee. The family will receive friends from 4:00 PM to 8:00 PM Monday, April 08, 2019 at Neal Funeral Home. Funeral services will be conducted at Neal Funeral Home at 1:00 PM Tuesday, April 09, 2019, with Jon Shepherd and Roy Staggs officiating. Interment will follow at 1:00 PM on Wednesday, April 10, 2019 at Bethel Baptist Church Cemetery in Woodland, MS.